New York congressman Michael Grimm pleads guilty to felony tax charge. Congressman Michael Grimm leaves a press conference in April 2014. 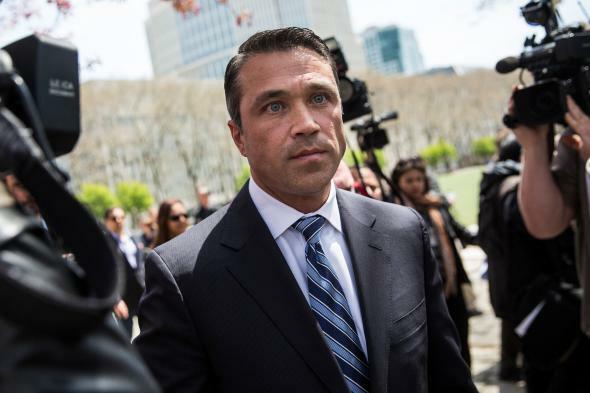 Congressman Michael Grimm pleaded guilty in federal court on Tuesday to one felony count of tax fraud. The Republican representing Staten Island, who was reelected to a third term in November despite federal felony charges, admitted to paying employees off the books and then filing fraudulent tax returns. “What is your plea to count four of the indictment, guilty or not guilty,” the judge asked. “While operating a restaurant we underestimated the gross receipts, used some of that money to pay employees off the books, as well as to pay other expenses of the restaurant,” Grimm said. They then based their tax returns on that underreporting, he said. The indictment grew out of an investigation of political contributions and centered on the underreporting of hundreds of thousands of dollars in wages and more than $1 million in revenue at a Manhattan fast-food restaurant owned by Grimm called Healthalicious. Grimm reportedly negotiated with prosecutors agreeing to plead guilty to one count of aiding in the preparation of a false tax return and pay restitution on tax returns from 2007 to 2010. Grimm will be sentenced on June 8 and could face up to three years in prison. House Minority Leader Nancy Pelosi has called for Grimm to lose his seat over the case despite rumors that Grimm, if he avoids jail time, hopes to stay in Congress, Roll Call reports.